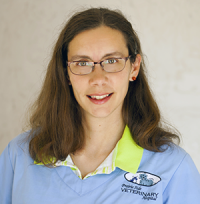 After Katie graduated with her DVM in 2006 from University of Wisconsin – Madison she spent 11 years practicing in Wichita, KS. However, she always wanted to return to Wisconsin where she spent most of her childhood and where most of her extended family lives. Katie was happy to join the Franksville Vet team in July of 2017! Katie gravitated towards veterinary medicine because of her love of problem solving and an affinity for the sciences. Becoming a veterinarian helped her experience both on a daily basis, in addition to helping the furry animals she has always loved. Above all, she really enjoys the “Aha!” moment of finding out what is troubling her patients, laying out a course of action, and then seeing them feel better again. Dermatology can be especially satisfying because once the right treatment is found, the improvement can be dramatic. Katie had the privilege of spending time in Nicaragua and Ecuador with Christian Veterinary Missions and was able to exchange knowledge with the local animal care teams in the remote villages. That experience taught her just how much can be accomplished with few resources, as long as one listens hard and is willing to think creatively. Katie is married and has three children and two cats, Maguffin the Fluffin and Shiny Pteranadon (children picked the names). ‘Guffin enjoys sitting in windows and hunting ice cubes, while Shiny prefers stealing entire skeins of yarn out of her knitting bag and chewing the fingers off Barbies. She enjoys all fiber arts and taught herself crochet, learned knitting from her grandmother, and most recently started quilting. She also loves cooking and baking, especially pies.